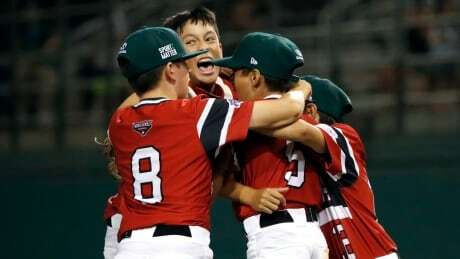 WILLIAMSPORT, Pa., — With the bases loaded, the crowd roaring and Mexico down to their final out, Canada's pitcher Nate Colina caught a line-drive to secure a stunning 6-4 victory over the Mexicans at the Little League World Series on Monday night. The capacity crowd erupted in Canadian celebration on one side and Mexican devastation on the other as the youngsters from Whalley, B.C., piled on top of one another on the mound. It's the first time Canada has defeated Mexico at the Little League World Series since 2012 — last year Mexico ended Canada's hopes at the baseball classic. Canada plays Puerto Rico Tuesday afternoon inside historic Lamade Stadium. First pitch is scheduled for 3 p.m. ET. "We know we have the support of everyone back home across the country, especially in our neck of the woods," head coach Mike Marino said. "It's a good feeling. We're happy to be here and still playing baseball." After Monday night's game, Nate Colina talked about what was going through his mind as he settled in to throw a pressure-packed pitch with the game on the line. "I knew there were two outs, so I just had to keep it simple and focus on the batter," Colina said. "I just couldn't drop that ball when it was hit at me. Don't drop it." The remarkable Canadian run continues in Williamsport. On Saturday night the team won a marathon thriller over Spain with a walk-off winner in the 10th inning. Then they followed it up with this heart stopping victory over Mexico — that moment in the last inning with the bases loaded for the Mexicans is something the coach won't soon forget. "My heart was pounding and I'm sure everyone else's heart was pounding," Marino said. "If you don't want to be in that moment, you shouldn't be playing. I looked around the dugout and thought 'this is why we play the game.'" Canada was able to mount a massive lead early in the game thanks in part to a clutch triple by Kai Sheck. With the bases loaded in the second inning and two out, Sheck delivered a triple to the right field wall, scoring three Canadian runs and opening up a 5-0 lead. "It was pretty amazing being in that situation and hitting for your team. That was amazing. It was incredible," Sheck said. Watching it all from the stands were the parents and grandparents of Sheck. His mom, Danna Sheck, was overrun with emotion when she watched her son deliver the key hit. "Seeing the proud tears in my husband's eyes brings me back to all the countless hours that Kai and my husband, Levi, have spent in the batting cage in our back yard," Danna said. "Hard work does pay off. We are over the moon proud of our boy." With Canada up just two runs and the Mexicans applying pressure in the final inning with the bases loaded, the coaches called a timeout. It was at that point that Canadians Jordan Jaramillo and Dio Gama had a chat at second base. "I asked Dio if he was nervous and he said he was," Jaramillo said. "So I told him there was no need to be nervous. This is just baseball." The two went back to their positions and settled into their defensive stances. It was right after that talk Colina made the catch to win the game for Canada. "We are all so excited right now," Jaramillo said. "Mexico is a good team, but we felt pretty confident going into this game." And how are they celebrating? "Pizza," coach Marino said. "We had it after our win against Spain, so we'll stick with what's working."